A more fluid labor market is socially valuable, because it helps unemployment rates stay lower and offers broader opportunity. Also, employers who know that employees have decent and readily available outside options have better incentive to treat employees well. But most economists recognize that labor markets are full of "frictions," which is a catch-all term for the costs involved in making connections between willing workers and willing employers. (Indeed, the 2010 Nobel Prize in economics went to Peter A. Diamond, Dale T. Mortensen and Christopher A. Pissarides "for their analysis of markets with search frictions".) There's an old rule of thumb that one should expect a month of job search for every $10,000 you would like to earn, and even though that specific number is probably an unreliable guess, the comment makes the point that the time and information costs involved in finding a new job can be high. One of the very practical barriers for a lot of unemployed workers is a lack of information about available jobs, and a lack of experience in how to find the relevant information. 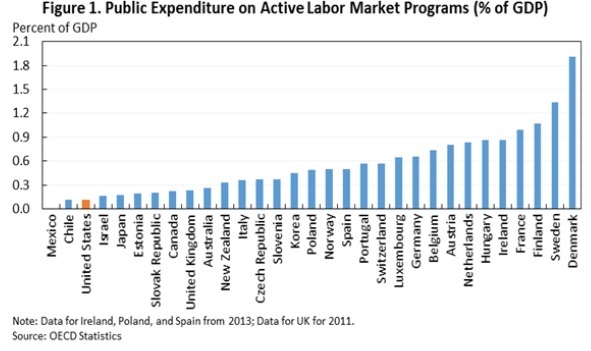 Active labor market policies are a government attempt to reduce these costs. In a December 2016 Issue Brief, the Council of Economic Advisers discusses the subject of "Active Labor Market Policies: Theory and Evidence for What Works." The CEA defines active labor market policies as "policies that promote participation in the labor force and help workers match to employment opportunities. These programs include employment services, job search assistance, job training programs, and employment subsidies. But the empirical evidence also finds that not all approaches to supporting employment and earnings are equally successful, with some programs having substantial benefits relative to their costs while others do not." Of course, the hard-headed question is whether active labor market policies work--and whether some work better than others. The CEA report cites an array of evidence on this point (for readability, the quotations that follow omit citations and footnotes). On offering job search assistance and requiring participation from those receiving government benefits: "While job search assistance leads to faster employment, there is little evidence that it affects wages. Job search programs may also yield other benefits. When job search is required of recipients of unemployment insurance (UI), research shows that reemployment assistance typically saves the government several hundred dollars per participant in UI benefits by reducing time to reemployment ..."
On offering job training for various groups: "Job training programs focusing on economically disadvantaged adults, typically those with low earnings or levels of education, consistently yield significant positive effects on employment outcomes. Recent evidence comes from evaluations of WIA [Workforce Investment Act] training programs for disadvantaged adults ... these training programs increased quarterly earnings between $500 and $800 (in the range of 10 to 25 percent increases) for workers by three years after receiving training, in addition to positive employment effects. ... Sectoral training, one specific type of training program that focuses on training workers for jobs in particular industries and which typically develops and implements training programs in partnership with employers, is an especially promising avenue for disadvantaged workers. ... In one successful example of training leading to positive results for mid-career workers ... when dislocated workers obtain training in the form of community college coursework, the equivalent of one academic year of courses translates into increases in long-term earnings of between seven and ten percent. They also find that these effects are more pronounced when coursework is concentrated on quantitative courses." On employment subsidies for hiring workers: "While effective at encouraging employment, an important consideration for employment subsidies is that they be designed and administered in ways that mitigate two potential drawbacks: The first is that some portion of their value may be captured by firms who would have hired such workers in any event. A second is that targeted employer-based subsidies may lead to stigmatization of the targeted group among potential employers." I've written before on "What Do We Know about Subsidized Employment Programs?" (April 25, 2016), and noted that there are a couple of large-scale studies underway that should provide fuller evidence here. 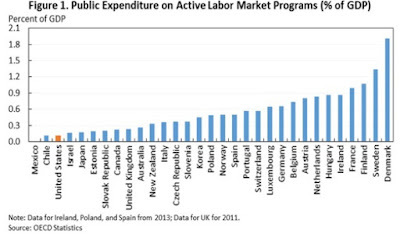 Just to be clear, not all the evidence on active labor market policies is positive. 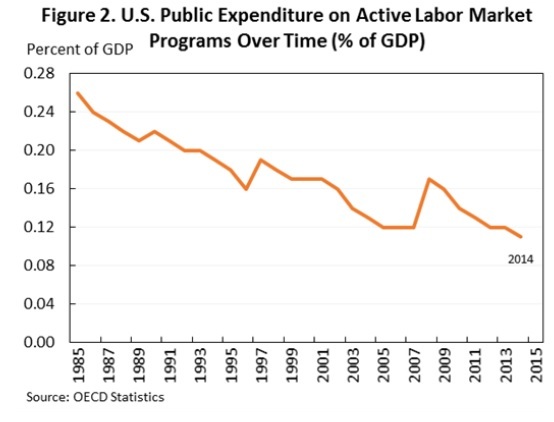 The design and context of active labor market policies matters. But in my reading, the evidence is certainly strong enough to support additional large-scale experimentation with these policies, which can be designed in a way to facilitate a later evaluation of the results. Finally, I'll add that the main focus of the CEA report is on US-based evidence about active labor policies, but an array of international evidence is also available. For a literature review, interested readers might begin with a literature review paper by David Card, Jochen Kluve and Andrea Weber What Works? A Meta Analysis of Recent Active Labor Market Program Evaluations," published by the German Institute for the Study of Labor (IZA Discussion Paper No. 9236, July 2015). The provisions of the Edict are, in simple language, that maximum prices are set for articles of trade and for services, and that these are not to operate in such a way as to raise prices where the current level of prices is lower; that traders shall not buy in localities where prices are low and transport and sell the goods elsewhere at the maximum price; that the penalty for the violation of the law is death, and that leniency is not to be expected in return for a conciliatory attitude in court; further, that the same penalty applies to him who purchases at an illegally high price, and to him who hoards goods and refuses to put them on the market at legal price. After the preamble come the price lists arranged in schedules. "Before passing to the text of the Edict, we might consider briefly its working; the available material, in fact, permits only a brief treatment. The writer De Mortibus Persecutorum, in the seventh chapter, says, "He (Diocletian) likewise, when by his varied unreasonable tax-levies he caused an immeasurable rise in prices, tried to regulate the prices of merchandise. Then much blood was shed over trifling and cheap articles; through fear, wares were withheld from market, and the rise in prices became much worse, until after the death of many men the law was through very necessity rescinded." In other words, the price limits set in the Edict were not observed by the traders, in spite of the death penalty provided in the statute for its violation; would-be purchasers, finding that the prices were above the legal limit, formed mobs and wrecked the offending traders' establishments, incidentally killing the traders, though the goods were after all of but trifling values; the other traders, rather than sell at prices which would bankrupt them, hoarded their goods against the day when the restrictions should be removed, and the resulting scarcity of wares actually offered for sale caused an even greater increase in prices, so that what trading went on was at illegal prices, and therefore performed clandestinely. "Ultimately the Edict was of necessity rescinded; how long it remained in force is unknown. But Diocletian is known to have abdicated the imperial power in 305, four years after the promulgation of the Edict; the cause assigned was ill-health resulting from the strain and burden of government. It would not be going very far from likelihood to assume that the failure of the Edict to restore business stability was a considerable factor in his poor health and abdication, and that the Edict was rescinded very soon after his abdication, if not indeed before. It remained law, therefore, not much if at all over four years." As anyone with a smattering of economics--or just knowledge about human nature--might expect, it's highly unlikely that a sudden and unprecedented upsurge in greed and avarice circa 300 AD caused the rapid price rises. Instead, the more likely causes stem from high spending to finance the courts of the time, which in turn was financed by a currency (the denarius) in which the amount of silver was continually being reduced and which Diocletian turned to copper. As the value of the currency fell, prices increased--and the short-lived Diocletian Edict was the result. "What we have known for a while is that the dollar has a unique role in international trade since most of trade invoicing is done in dollars. More recent research shows that these dollar prices tend to be sticky—that is, these dollar prices are far more stable than exchange rates. For non-U.S. economies, therefore, a depreciation of their currency relative to the dollar leads to almost a one-to-one increase in the price of imported goods in their own currency and, therefore, the pressures on inflation are high. On the other hand, because dollar prices of traded goods are relatively stable, the inflationary pressures on the U.S. economy are weak. "A weaker dollar has very little effect on inflation in the U.S., has an expansionary effect on exports and has a negligible effect on imports. On the other hand, a weaker rupee is highly inflationary for India, has a significant impact on its imports and has a negligible impact on exports. This expectation that a weaker currency for a non-U.S. economy is good for a country’s exports does not line up with the facts. ... What it basically means is that central bankers in developing countries have to respond pretty aggressively to exchange rate depreciations." "So what we analyzed in our paper is a set of fiscal instruments that would deliver the same outcomes as a currency devaluation. This idea goes back to Keynes, as you said, who proposed import tariffs and export subsidies as a substitute for currency devaluation. Given the illegality of using tariffs of this nature, we instead explored the role of value-added taxes and payroll subsidies or, more specifically, raising value-added taxes and cutting payroll taxes. What we found, surprisingly, is that this form of intervention did extremely well in mimicking the outcomes of a currency devaluation, not approximately but exactly. "The mechanism works as follows. When a country raises its value-added tax, foreign exporters selling to the country increase their prices, making them less competitive. Domestic firms that sell locally also face the high value-added taxes, but because these prices are slow to adjust and because the government provides them with a payroll tax cut, their prices do not rise as much. That makes them more competitive in the same way that an exchange rate devaluation would. Moreover, a fiscal devaluation has the same effect on inflation and the same effect on redistribution as an exchange rate devaluation. "In terms of policy traction, France did implement a partial fiscal devaluation. They cut payroll taxes but did not raise value-added taxes, despite the announcement that they would. So they went only halfway there. Despite the virtues, there are political challenges to implementing a large fiscal devaluation. Countries live through a 10 percent exchange rate depreciation without immense anxiety, but if you raise value-added taxes by 10 percent, that would be very salient and likely politically infeasible. But the broader point we made was that there are instruments other than exchange rate devaluations that a country can use to gain trade competitiveness." Price Controls in the Colonial United States: "A Sharping Set of Mushroom Pedlers"
The story is told by William R. Staples in the Annals of the Town of Providence, From its First Settlement to the Organization of the City Government in June 1832, published in 1843, and available via the magic of Google Books (for example, here). The passages quoted here run from pp. 271-277, Staples describes the background of the price control legislation in this way. "In January 1777, a convention of deputies from the New-England States met in Providence, to state the prices of goods and labor. ... Congress and the states too, had thus carried on the war by issuing bills of credit, The issues of these were regulated by the wants of army and navy. They constituted the currency the country. Every successive issue of them, tended to depreciate their value, as it necessarily increased the amount, and consequently rendered day of payment more distant and less certain. This depreciation of the currency produced an increase in the prices of all the necessaries of life, and this convention was called to regulate these prices. "They met, and after some deliberation, agreed upon certain prices to be paid and received for labor and almost every necessary article. The General Assembly of this state being in session, at same time, the convention reported to them immediately passed an act with the following popular title. "An act to prevent monopolies and oppression, by excessive and unreasonable prices, for many of the necessaries and conveniences of life, and for preventing engrossers, and for the better supply of our troops in the army, with such necessaries may be wanted. This act embodied and adopted the report of the convention, and added other articles to it, so that it included almost every article, called necessary or convenient, from a bushel of wheat down to a quart of milk. He who bought or for a higher rate, was to "be accounted oppressive, an enemy to his country, and guilty of a breach of this act," and to be subject to a fine." "The General Assembly were not unanimously in favor of this act There were some who saw how futile must be every attempt to fix the prices of articles, when the currency in which they were to be paid for was constantly depreciating in value, or in fact had no fixed value." Because, by experience, we, as well as the inhabitants of the other states, find it almost impossible to execute such acts, at least without a degree of rigor and severity heretofore unknown in these free states; and, while it remains in its present situation, it tends only to weaken government, and bring all laws into contempt, and even if it could be executed, it would operate as a very heavy and unreasonable tax upon the sellers, who are generally the enterprising and the industrious: It would prevent foreigners from shipping goods to our coasts, and cause our own merchants to order theirs to the southern states, and, in general, discourage foreign trade, in carrying on which, the risk is great and very uncertain and variable, according to circumstances, from time to time, and therefore not accurately computable three years before hand. It would also tend to discourage agriculture and manufactures among ourselves, as the prospect of some extraordinary gain generally excites men to extraordinary exertions in all the different branches of business. It hath a tendency to exclude from our markets every thing extraordinary in its kind, and of course, to prevent all improvement; to discourage industrious laborers, by allowing the indolent the same wages; for the scarcity of laborers will find employment for all, as the scarcity of goods will bring nearly all qualities up to the prices of the first rate, by which means, articles of inferior quality will be sold dearer to the poor, than what they would be afforded at if those of the first rate quality should be sold higher. This has been our case, and if the whole money only measure the whole property a proportionable part of the money ought to measure the same proportionable part of the property, and neither more or less, for either would be injustice. Therefore, stipulating prices below this proportion, is as real injustice, as raising them above it, and this proportion is so nice a point, that nothing but the wants of mankind, can accurately hit upon it. Trade, when left free from fetters and embarrassments, will of itself settle down nicely to this proportion, and keep to it closer, than any force whatever can bring it. There's a sort of parlor game that the economically-minded sometimes play around the Christmas holiday, related to A Christmas Carol, by Charles Dickens. Was Dickens writing his story as an attack on economics, capitalism, and selfishness? After all, his depiction of Ebenezer Scrooge, along with his use of phrases like "decrease the surplus population" and "a good man of business" would suggest as much, and a classic example of such an interpretation is here. Or was Dickens just telling a good story with distinct characters? After all, Scrooge is portrayed as an outlier in the business community. The warm portrayal of Mr. Fezziwig certainly opens the possibility that one can be a successful man of business as well as a good employer and a decent human being. And if Scrooge hadn't saved money, would he have been able to save Tiny Tim? It's all a good "talker," as they say about the topics that get kicked around on radio shows every day. The article does not seem especially well-known today, but it is the source of a couple of the most common quotations from Charles Dickens about "political economy," as the study of economics was usually called at the time. Early in the piece, Dickens wrote: ""Political Economy was a great and useful science in its own way and its own place; but ... I did not transplant my definition of it from the Common Prayer Book, and make it a great king above all gods." Later in the article, Dickens wrote: "[P]olitical economy is a mere skeleton unless it has a little human covering and filling out, a little human bloom upon it, and a little human warmth in it." not mean that he was warm; he was coldly and bitingly emphatic as a frosty wind is. The receipt of this question was like the receipt of a jerk of the nose; he was so short and sharp. "This Preston strike is a nice piece of business!" said the gentleman. "A pretty piece of business!" "It is very much to be deplored," said I, "on all accounts." I deferentially enquired, who wanted to be ground? "The hands," said Mr. Snapper. " The hands on strike, and the hands who help 'em." abruptly, " Was I a delegate?" I set Mr. Snapper right on that point, and told him I was no delegate. "I am glad to hear it," said Mr. Snapper. "But a friend to the Strike, I believe?" "Not at all," said I. "A friend to the Lock-out?" pursued Mr. Snapper. Mr. Snapper's rising opinion of me fell again, and he gave me to understand that a man must either be a friend to the Masters or a friend to the Hands. "He may be a friend to both," said I.
Mr. Snapper didn't see that; there was no medium in the Political Economy of the subject. I retorted on Mr. Snapper, that Political Economy was a great and useful science in its own way and its own place; but that I did not transplant my definition of it from the Common Prayer Book, and make it a great king above all gods. Mr. Snapper tucked himself up as if to keep me off, folded his arms on the top of his counterpane, leaned back and looked out of the window. "Pray what would you have, sir," enquire Mr. Snapper, suddenly withdrawing his eyes from the prospect to me, "in the relations between Capital and Labour, but Political Economy?" I always avoid the stereotyped terms in these discussions as much as I can, for I have observed, in my little way, that they often supply the place of sense and moderation. I therefore took my gentleman up with the words employers and employed, in preference to Capital and Labour. "I believe," said I, "that into the relations between employers and employed, as into all the relations of this life, there must enter something of feeling and sentiment; something of mutual explanation, forbearance, and consideration; something which is not to be found in Mr. M'CulIoch's dictionary, and is not exactly stateable in figures; otherwise those relations are wrong and rotten at the core and will never bear sound fruit." Mr. Snapper had no doubt, after this, that I thought the hands had a right to combine? "I am not a Preston master," interrupted Mr. Snapper. "When the respectable combined body of Preston masters," said I, " in the beginning of this unhappy difference, laid down the principle that no man should be employed henceforth who belonged to any combination—such as their own—they attempted to carry with a high hand a partial and unfair impossibility, and were obliged to abandon it. This was an unwise proceeding, and the first defeat." Mr. Snapper had known, all along, that I was no friend to the masters. "Pardon me," said I; " I am unfeignedly a friend to the masters, and have many friends among them." "Yet you think these hands in the right?" quoth Mr. Snapper. "By no means," said I; " I fear they are at present engaged in an unreasonable struggle, wherein they began ill and cannot end well." Mr. Snapper, evidently regarding me as neither fish, flesh, nor fowl, begged to know after a pause if he might enquire whether I was going to Preston on business? Indeed I was going there, in my unbusinesslike manner, I confessed, to look at the strike. "To look at the strike!" echoed Mr. Snapper fixing his hat on firmly with both hands. "To look at it! Might I ask you now, with what object you are going to look at it?" and explanation at home? I do not suppose that such a knotted difficulty as this, is to be at all untangled by a morning-party in the Adelphi; but I would entreat both sides now so miserably opposed, to consider whether there are no men in England above suspicion, to whom they might refer the matters in dispute, with a perfect confidence above all things in the desire of those men to act justly, and in their sincere attachment to their countrymen of every rank and to their country. Masters right, or men right; masters wrong, or men wrong; both right, or both wrong; there is certain ruin to both in the continuance or frequent revival of this breach. And from the ever-widening circle of their decay, what drop in the social ocean shall be free! Charles Dickens wrote what has become one of the iconic stories of Christmas day and Christmas spirit in A Christmas Carol. But of course, the experiences of Ebenezer Scrooge are a story, not a piece of reporting. Here's a piece by Dickens written for the weekly journal Household Words that he edited from 1850 to 1859. It's from the issue of January 26, 1856, with his first-person reporting on "A Nightly Scene in London." Poverty in high-income countries is no longer as ghastly as in Victorian England, but for those who take the time to see it in our own time and place, surely it is ghastly enough. On the fifth of last November, I, the Conductor of this journal, accompanied by a friend well-known to the public, accidentally strayed into Whitechapel. It was a miserable evening; very dark, very muddy, and raining hard. There are many woful sights in that part of London, and it has been well-known to me in most of its aspects for many years. We had forgotten the mud and rain in slowly walking along and looking about us, when we found ourselves, at eight o'clock, before the Workhouse. Crouched against the wall of the Workhouse, in the dark street, on the muddy pavement-stones, with the rain raining upon them, were five bundles of rags. They were motionless, and had no resemblance to the human form. Five great beehives, covered with rags— five dead bodies taken out of graves, tied neck and heels, and covered with rags— would have looked like those five bundles upon which the rain rained down in the public street. "What is this! " said my companion. "What is this!" "Some miserable people shut out of the Casual Ward, I think," said I. We had stopped before the five ragged mounds, and were quite rooted to the spot by their horrible appearance. Five awful Sphinxes by the wayside, crying to every passer-by, " Stop and guess! What is to be the end of a state of society that leaves us here!" As we stood looking at them, a decent working-man, having the appearance of a stone-mason, touched me on the shoulder. "This is an awful sight, sir," said he, "in a Christian country!" "GOD knows it is, my friend," said I. "I have often seen it much worse than this, as I have been going home from my work. I have counted fifteen, twenty, five-and-twenty, many a time. It's a shocking thing to see." us a little while, wished us good-night, and went on. time in passing the old porter, for I saw in his watery eye a disposition to shut us out. "Be so good as to give that card to the master of the Workhouse, and say I shall be glad to speak to him for a moment." We were in a kind of covered gateway, and the old porter went across it with the card. Before he had got to a door on our left, a man in a cloak and hat bounced out of it very sharply, as if he were in the nightly habit of being bullied and of returning the compliment. "Now, gentlemen," said he in a loud voice, "what do you want here?" "First," said I, " will you do me the favor to look at that card in your hand. Perhaps you may know my name." "Yes," says he, looking at it. " I know this name." find fault with the system you administer, but pray understand that I know you are here to do a duty pointed out to you, and that I have no doubt you do it. Now, I hope you won't object to tell me what I want to know." "No," said he, quite mollified, and very reasonable, " not at all. What is it?" "Do you know that there are five wretched creatures outside?" "I haven't seen them, but I dare say there are." "Do you doubt that there are?" "No, not at all. There might be many more." ''Are they men? Or women?" "Women, I suppose. Very likely one or two of them were there last night, and the night before last." "There all night, do you mean?" My companion and I looked at one another, and the master of the Workhouse added quickly, "Why, Lord bless my soul, what am I to do? What can I do ? The place is full. The place is always full—every night. I must give the preference to women with children, mustn't I? You wouldn't have me not do that?" "Surely not," said I. "It is a very humane principle, and quite right; and I am glad to hear of it. Don't forget that I don't blame you." "Just so. I wanted to know no more. You have answered my question civilly and readily, and I am much obliged to you. I have nothing to say against you, but quite the contrary. Good night!" "Good night, gentlemen!" And out we came again. We went to the ragged bundle nearest to the Workhouse-door, and I touched it. No movement replying, I gently shook it. The rags began to be slowly stirred within, and by little and little a head was unshrouded. The head of a young woman of three or four and twenty, as I should judge; gaunt with want, and foul with dirt; but not naturally ugly. "Tell us," said I, stooping down. "Why are you lying here?" "Because I can't get into the Workhouse." She spoke in a faint dull way, and had no curiosity or interest left. She looked dreamily at the black sky and the falling rain, but never looked at me or my companion. "Were you here last night?" "Yes, All last night. And the night afore too." "Do you know any of these others?" "I know her next but one. She was here last night, and she told me she come out of Essex. I don't know no more of her." "You were here all last night, but you have not been here all day?" "Where have you been all day?" ''What have you had to eat?" "Come!" said I. "Think a little. You are tired and have been asleep, and don't quite consider what you are saying to us. You have had something to eat to-day. Come! Think of it!" "No I haven't. Nothing but such bits as I could pick up about the market. Why, look at me!" She bared her neck, and I covered it up again. "If you had a shilling to get some supper and a lodging, should you know where to get it?" "Yes. I could do that." "For GOD'S sake get it then!" I put the money into her hand, and she feebly rose up and went away. She never thanked me, never looked at me— melted away into the miserable night, in the strangest manner I ever saw. I have seen many strange things, but not one that has left a deeper impression on my memory than the dull impassive way in which that worn-out heap of misery took that piece of money, and was lost. and I glanced, with a new horror upon us, at the two last, who had dropped against each other in their sleep, and were lying like broken images. She said, she believed they were young sisters. These were the only words that were originated among the five. And now let me close this terrible account with a redeeming and beautiful trait of the poorest of the poor. When we came out of the Workhouse, we had gone across the road to a public house, finding ourselves without silver, to get change for a sovereign. I held the money in my hand while I was speaking to the five apparitions. Our being so engaged, attracted the attention of many people of the very poor sort usual to that place; as we leaned over the mounds of rags, they eagerly leaned over us to see and hear; what I had in my hand, and what I said, and what I did, must have been plain to nearly all the concourse. When the last of the five had got up and faded away, the spectators opened to let us pass; and not one of them, by word, or look, or gesture, begged of us. way for us in profound silence, and let us go. any business to mind them. Without disparaging those indispensable sciences in their sanity, I utterly renounce and abominate them in their insanity; and I address people with a respect for the spirit of the New Testament, who do mind such things, and who think them infamous in our streets. My family always had real Christmas trees when I was growing up. I've always had real trees as an adult. Living in my own little bubble, it thus came as a shock to me to learn that, of the households that have Christmas trees, over 80% use an artificial tree, according to Nielsen survey results commissioned by the American Christmas Tree Association (which largely represents sellers of artificial trees). But in a holiday season where the focus is often on whether we are naughty or nice, what choice of tree has greater environmental impact? 1) One artificial tree used for one year has greater environmental impact than one natural tree. However, an artificial tree can also be re-used over a number of years. Thus, there is some crossover point, if the artificial tree is used for long enough, that its environmental effect is less than an annual series of trees. For example, the ellipsos study finds that an artificial tree would need to be used for 20 years before its greenhouse gas effects would be less than those of an annual series of natural trees. The PE Americas study offers a wide range of scenarios, and summarizes, but here is the situation "for the base case when individual car transport distance for tree purchase is 2.5 miles each way. Because the natural tree provides an environmental benefit in terms of Global Warming Potential when landfilled, and Eutrophication Potential when composted or incinerated, there is no number of years one can keep an artificial tree in order to match the natural tree impacts in these cases. ... For all other scenarios, the artificial tree has less impact provided it is kept and reused for a minimum between 2 and 9 years, depending upon the environmental indicator chosen." 2) The full analysis needs to look at effects across all the full life-cycle of the tree, whether natural or artificial. This seems to involve the following steps. Under what conditions is the tree manufactured or cultivated, with what use of energy, fertilizer, and logging methods? By what combination of transportation mechanisms is the finished tree moved to the home? A substantial share of artificial trees are manufactured in China and then shipped to North America. What are the different issues in use of the tree, including use of water and emissions of fumes? What is the end-of-life for the tree? For example, the carbon in a natural tree will be stored for some decades if the tree goes into a landfill, but not if if is composted or incinerated. 3) The full analysis also needs to look at a range of possible effects. For example, the PE America study looked at "global warming potential (carbon footprint), primary energy demand, acidification potential, eutrophication potential, and smog potential." 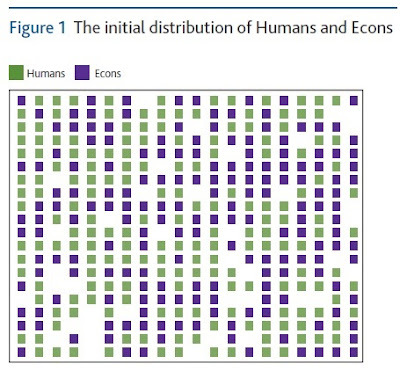 Here's a figure showing 14 categories of analysis from the ellipsos study, with a comparison between natural and artificial trees on a number of dimensions. The ellipsos study sums up this way: "When aggregating the data in damage categories, the results show that the impacts for human health are approximately equivalent for both trees, that the impact for ecosystem quality are much better for the artificial tree, that the impacts for climate change are much better for the natural tree, and that the impacts for resources are better for the natural tree ..."
4) In the context of many other holiday and everyday activities, the environmental effects of the tree are small. The studies offer some comparisons of the environmental effects of the tree compared with the electricity used to light the tree, the driving by a household to pick up the tree, and even the environmental effect of the tree stand. For example, in comparing Primary Energy Demand for the tree and the energy demand for lighting the tree. For an artificial tree, the PE Americas study reports: "The electricity consumption during use of 400 incandescent Christmas tree lights during one Christmas season is 55% of the overall Primary Energy Demand impact of the unlit artificial tree studied, assuming the worst‐case scenario that the artificial tree is used only one year. For artificial trees kept 5 and 10 years respectively, the PED for using incandescent lights is 2.8 times and 5.5 times that of the artificial tree life cycle." For a natural tree: "The life cycle Primary Energy Demand impact of the natural tree is 1.5 ‐ 3.5 times less (based on the End‐of‐Life scenario) than the use of 400 incandescent Christmas tree lights during one Christmas season." In comparing the environmental effects of driving with those of the tree, ellipsos writes: "Due to the uncertainties of CO2 sequestration and distance between the point of purchase of the trees and the customer’s house, the environmental impacts of the natural tree can become worse. For instance, customers who travel over 16 km from their house to the store (instead of 5 km) to buy a natural tree would be better off with an artificial tree. ... [C]arpooling or biking to work only one to three weeks per year would offset the carbon emissions from both types of Christmas trees." The PE Americas report strikes a similar theme: "Initially, global warming potential (GWP) for the landfilled natural tree is negative, in other words the life cycle of a landfilled natural tree that is a GWP sink. Therefore, the more natural trees purchased, the greater the environmental global warming benefit (the more negative GWP becomes). However, with increased transport to pick up the natural tree, the overall landfilled natural tree life cycled becomes less negative. When car transport becomes greater than 5 miles (one‐way), the overall life cycle of the natural tree is no longer negative, and there is a positive GWP contribution." Even the tree stand for a natural tree has an environmental cost that can be considered in the same breath with the costs of a natural tree. PE Americas: "The tree stand is a significant contributor to the overall impact of the natural tree life cycle with impacts ranging from 3% to 41% depending on the impact category and End‐of‐Life disposal option." I would add that the environment effect of the ornaments on the trees may be as large or greater than the effect of the tree itself. Data from the U.S. Census Bureau shows that America imported $1 billion in Christmas tree ornaments from China (the leading supplier) between January to September 2012, but only $140 million worth of artificial Christmas trees. Thus, spending on ornaments is something like six times as high as spending on trees. The choice of what kind of lights on the tree, or whether to drape the house and front yard with lights, is a considerably more momentous environmental decision than the tree itself. Of course, these kinds of comparisons don't even try to compare the environmental cost of the tree with the cost of the presents under the tree, or the long-distance travel to attend a family gathering. Thus, the PE Americas study concludes: "Consumers who wish to celebrate the holidays with a Christmas tree should do so knowing that the overall environmental impacts of both natural and artificial trees are extremely small when compared to other daily activities such as driving a car. Neither natural nor artificial Christmas tree purchases constitute a significant environmental impact within most American lifestyles." Similarly, ellipsos writes: "Although the dilemma between the natural and artificial Christmas trees will continue to surface every year before Christmas, it is now clear from this LCA study that, regardless of the chosen type of tree, the impacts on the environment are negligible compared to other activities, such as car use." Certainly, celebrations at holidays and big events can sometimes be exorbitant and over the top. But the use of a Christmas tree, and the choice between a natural tree or an artificial tree, is a small-scale luxury. If the environmental issue is bothering you, even knowing these facts, make a resolution to use your artificial tree for a few more years, rather than replacing it, or to save some energy in January by driving less or being more vigilant about turning off unneeded lights. Gathering around the tree should be one less reason for moralizing around the holidays, not one more. So celebrate with good cheer and generous moderation. If you're looking for a overview of how a range of economists see many issues in the labor market, written in a manner that will readily accessible to the general public, you should check out The US Labor Market: Questions and Challenges for Public Policy, , edited by Michael Strain, and freely available online from the American Enterprise Institute. In roughly 300 pages, it includes nine big questions, each followed by two essays from different points of view. For a sample of what's includes, let me give one example of such an exchange, and then I'll append the full tables of contents. Dean Baker and Robert Z. Lawrence address the big question: "Is Productivity the Most Important Determinant of Compensation?" "The notion that workers’ pay is linked to their marginal productivity has enormous appeal to economists. Much of the reason is for the simple logic of the proposition. Why would an employer ever pay a worker more than the value of what she produced? And conversely, if a worker were paid less than her marginal product, why wouldn’t she seek out an employer who was willing to pay a wage equal or close to the value of her marginal product? ... However comforting this view of the labor market may be, there are good reasons for believing it does not apply in important ways to those at both the top and bottom of the distribution. Furthermore, even in the sectors of the labor market where the equation of pay and marginal productivity may be largely true, government policies still play a huge role. The idea that the free market is determining incomes simply does not fit the facts." "I have shown that, when the data are presented in an appropriate way, they actually show that with the exception of a growing profit share since 2000, average economy-wide wages in the US have tended to reflect aggregate productivity growth. This has not meant that these wage gains have been equally or proportionately shared. The failure of the wages of some workers to match aggregate productivity growth, however, should not necessarily be interpreted as a failure of the ability of conventional economics to explain these developments. Indeed, many of the explanations of the role played by globalization and technology in generating increased inequality rely on models in which workers are nonetheless paid their marginal products, i.e., in which wages reflect productivity. The same is true of explanations for the more recent increase in profit shares." I. Should We Be Concerned About the State of Economic Mobility in the US? II. 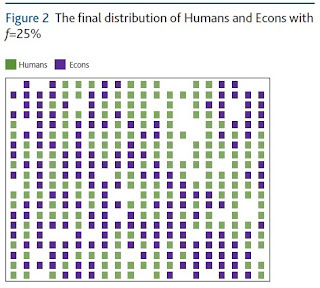 Is Productivity the Most Important Determinant of Compensation? "Does Productivity Still Determine Worker Compensation? Domestic and International Evidence,"
III. How Can We Build Workers’ Skills? IV. How Can We Make Work Pay? V. Do Public Policies That Reduce the Reward to Work Significantly Diminish Labor Supply? VI. What Are the Economic Effects of Lesser-Skilled Immigration on Lesser-Skilled Native Workers? VII. Would Cutting the Corporate Tax Rate Significantly Increase Jobs in the US? VIII. What Should We Do About Those Americans Who Are Especially Difficult to Employ? IX. Should We Be Concerned About Income Inequality? "When an electric car is charging overnight, it is drawing on a regional power grid and prompting power plants across the network to produce slightly more electricity. Depending on where in the U.S. that car is plugged in, the emissions at those power plants could be pretty dirty in their own right. ... In some cases, electric cars provide a clear win for the environment. The people living in Los Angeles, with its notoriously poor air quality and constricted topography, benefit a lot when a gas-powered car is removed from its freeways. Of course the electric car replacing it has its own emissions, but most electricity generation in the western U.S. is pretty clean. Totaled up across the country, the benefits clearly outweigh the costs. "Then there’s the case of New York City. When more electric cars plug into the power grid there, they are mostly drawing power from relatively dirty coal-fired plants in Pennsylvania – and a lot of the smoke that billows out of those smokestacks eventually gets blown east back to the New York metro area. ... That cycle plays out over hundreds of miles and is quite a bit less visceral than exhaust coming out of a tailpipe, but the ultimate effect on air quality is about the same for the New York area as a whole. Some suburban counties on Long Island and Connecticut are actually worse off with the extra power plant emissions than the local tailpipe emissions. Among the worst places to switch are North Dakota and Minnesota, where air quality is very good to begin with and additional exhaust from gas-powered cars dissipates quickly. The authors calculate that these regions should have a negative subsidy – actually a tax – of thousands of dollars on each electric car. Meanwhile, switching in western cities with bad air quality and a relatively clean power mix (Los Angeles, Houston, Phoenix) ends up being hugely beneficial for the environment." "The authors develop a simple model of job destruction driven by technological change and predict that, for a given level of unemployment, more creative destruction should improve self-reported life satisfaction. Ultimately, this is because economic growth leads to more job openings and higher earnings in the future. In other words, a city that can maintain 8% unemployment in the face of a chaotic job market (with lots of jobs being created and destroyed each year) should be a more satisfying place to live than a city with 8% unemployment and a stagnant labor market. ... The results suggest that job turnover and labor market dynamism might be an underrated factor of quality of life, perhaps nearly as important as unemployment in explaining happiness levels in differents parts of the country." "[S]ome economists have suggested that CEOs earning tens of millions of dollars should be giving back as much as 80 percent of their income to the government. Carnegie Mellon University economists Laurence Ales and Christopher Sleet don’t agree. Their recent paper ... says the marginal tax rate on top earning CEOs should be closer to 20 percent. Why? Because rewarding them for their hard work by letting them keep more of their paycheck leads to “spillover” effects that boost corporate profits, which can then be taxed and grow government coffers more quickly than collecting tax revenue from individual executives." This link includes audio of a 15-minute interview with the authors. "[T]ankers, trucking, and cargo planes pump more than one billion tons of CO2 into the atmosphere each year. This is equivalent to the emissions from the bottom 164 carbon-emitting countries in the world combined. ... [T]he shipping industry is still expecting to be hit with a carbon tax within the next few years. ... [A] carbon tax on shipping could reduce emissions, but also that such a policy would actually slightly hurt some of the countries with the most to lose from climate change. ... But in a cruel twist of fate, it's the same equatorial countries facing the greatest risks from rising temperatures -- especially sub-Saharan Africa, the Indian subcontinent, and southeast Asia -- that are also most reliant on fossil fuels to sell their goods around the globe." Americans are moving less. Here's an illustration from the US Census Bureau. The blue bars show the total number of movers (measured on the left-hand axis), while the red line shows the percentage of Americans who moved (measured on the right-hand axis). Back in the 1940s and 1950s, it wasn't unusual to have 20% of Americans move in a year, but now it's down to about 12%. The Census Bureau has also released a bunch of statistical tables on the various dimensions of geographic mobility, for those with a need to graze through the data. "Geographical Mobility: 2015 to 2016" focuses on the changes in the last year, while "CPS Historical Migration/Geographic Mobility Tables" offers a longer term view. For example, one figure shows that between the 2002-3 and 2015-16 measurements, the share of moves that were 50 miles or less rose from 32.3% of all moves to 42.3% of all moves. The main offsetting decline was in moves of between 200 to 499 miles, which fell from 20.7% of all moves back in 2002-3 to 13.8% in 2015-16. It's hard to know if the decline in labor force mobility is a real problem. The difficulty is that explaining why the fall has occurred has proven difficult, for reasons I've discussed in "Less Migration Within the United States" (August 24, 2011) and "Updates on the US Migration Puzzle" (August 6, 2013). Basically, the problem is that a lot of the explanations that might seem to make sense don't work very well on closer examination. For example, this trend to lower rates of moving has been going on since the 1980s, so it's clearly not related to a specific recession or recovery. It's also not related to patterns like an aging US population, or rising incomes, or patterns of jobs or homeownership. The decline in moving isn't notably greater after adjusting for these kinds of factors. One possible explanations is that the US has become more similar across regions, so there is just less motivation to move. Another is that information has become more available between regions, so people are less likely to move when just looking for work, and instead wait until they have a job in hand before moving. Other hypothesis are potentially more concerning. It may be that the the lower rate of moving is because over time the US economy is becoming less flexible and dynamic, in the sense that rates of job creation and destruction are declining, as discussed in Are US Labor Markets Becoming Less Fluid?" (January 9, 2015). A related factor could be that the role of new firms in job creation has been declining, as discussed in "The Decline of US Entrepreneurship" (August 4, 2014). I've heard some arguments that a number of big US cities which used to be magnets for in-migration from the rest of the country have experienced big run-ups in housing prices over time, which makes people less likely to relocate to those areas unless they already have a higher-paying job in hand. When people move, they don't just change their own situation. They also provide a connection and a trustworthy flow of information back to others at their place of origin, which sometimes leads to additional moves. Sure, it's the 21st century and you can learn all sorts of things about a different location with a web search. But a personal connection to someone who knows you, and your location, as well as the new location, is still a meaningful piece of information. "Professor Schelling analyzed superpower negotiations in the way that he analyzed the conflicts between, say, a blackmailer and his client, a parent and a child, or management and labor. In each case, he wrote, “there is a mutual dependence as well as opposition,” with each side seeking out tests of strength at less than crisis levels. Among other counterintuitive propositions he put forth, Professor Schelling suggested that one side in a negotiation can strengthen its position by narrowing its options, using as an example a driver in a game of chicken who rips the steering wheel from the steering column and brandishes it so his opponent can see that he no longer controls the car. He also argued that uncertain retaliation is more credible and more efficient than certain retaliation." But Schelling has a remarkably fluid ability to bring strategic and game theory insights to bear on a very wide range of situations. Paul Samuelson, a great economist in his own right who also knew how to turn a phrase, once wrote: "In Japan Thomas Schelling would be named a national treasure. Age cannot slow down his creativity, nor custom stale his infinite variety." 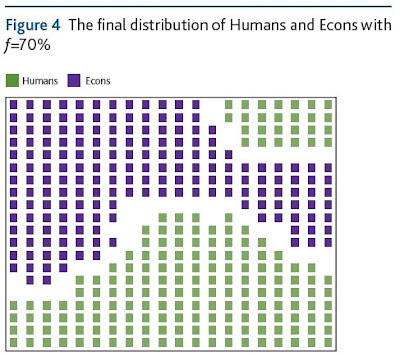 "Imagine there are two species named Econs and Humans who co-exist. Econs are always rational. Humans are emotional and sometimes make mistakes. Although Econs and Humans peacefully co-exist and live in the same city, they each have a slight preference for living closer to the same species. This propensity to want to be near others of their type can be characterised by a number f, which can be thought of as their strength of preference. It represents the fraction of neighbours that they ideally wish to be of the same species, with an f of 1 meaning that they will only be happy if all of their neighbours are of the same species. If agents of either type are unhappy, they can choose to move house and, at random, are given a new property. Over time, more and more agents will be happy with where they live and stop moving." But a striking finding from Schelling's work is that much lower levels of preference can still lead to considerable segregation. 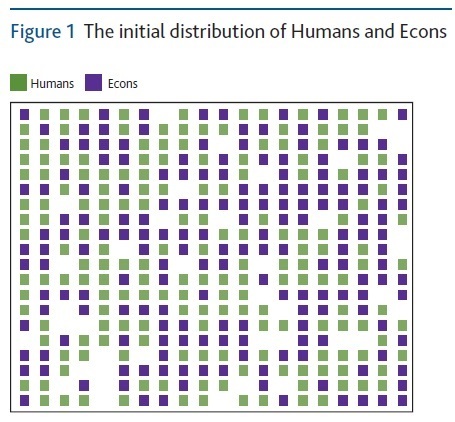 Indeed, there is often a "tipping point"--a concept brought into wide use by Schelling's work--where a relatively small change in preference leads to a much larger change in the degree of segregation. Turrell offers the example of what happens as the preference parameter rises from .25 to .26. 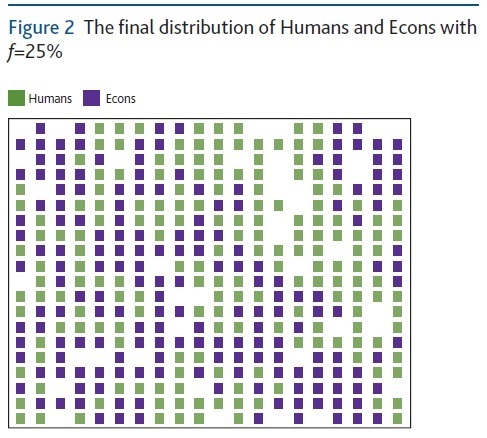 This figure shows that at .25, the two groups are still pretty well integrated. Apparently, a mild but non-zero degree of discriminatory feeling is consistent with a high degree of integration--which is a useful insight. But in this example, the rise from .25 to .26 is a tipping point, in which the degree of segregation (which can be measured by how many neighbors the agents have from the other group) rises substantially. Of course, you may wonder about many potential tweaks to this approach: what if the two groups had different preference, or each group had a range of preferences; are the outcomes different if one group is numerically larger than another: what would happen be like if the surface was not defined by squares within a larger square, but some other shape (like squares within an elongated rectangle, or triangles within a triangle). Agent-based modelling lets you ask all these kinds of questions, and through simulations of what will happen as the agents move, figure out what makes a difference and what doesn't. Turrell's essay uses Schelling's work as one example, and then delves into a broader discussion of agent-based modelling. The potential advantages of this approach is that you can see what overall outcome emerge from clearly-specified individual incentives. For example, one can explore stock markets or housing markets with different types of buyers and sellers who react differently to new information and to changes in prices. There are applications in particle physics, biology/ecology, epidemiology, computer science, military strategy, and others. In many ways, the greatest strength — the flexibility to model such a vast range of scenarios — is also the greatest weakness. The sheer extent of choice in constructing agent-based models as compared to more traditional economic models means that modellers face the problem of selecting the right components for the problem at hand. Simulation results can vary dramatically depending on which assumptions are used, so modellers must take great care in choosing them. Further work is needed to develop objective means for choosing the most appropriate assumptions. One particular concern is that at least in some circumstances, human agents may be able to perceive where a group dynamic is headed--and then change plans or form coalitions to alter that outcome. Ranging from nuclear strategy to issues of segregation and integration suggests the ability of Thomas Schelling to range across a wide array of topics and approaches. His early work introduced the idea of a "focal point," which is an outcome that many people recognize based on preference and tradition. Thus, he asked people where they would meet a stranger in Manhattan, if they had not previously agreed on a time and place to meet, and found that there was (at that time) a focal point of meeting at the information booth in Grand Central Station at noon. For a period in the 1980s, he focused on how to encourage people to stop smoking. For many economists, the first time we started thinking seriously about carbon emissions and the risks of climate chaange as an economic issue was when Schelling, back in 1992, gave his American Economic Association Presidental Address on the subject "Some Economics of Global Warming" American Economic Review, 82: 1, March, pp. 1-14). Another insight associated with Schelling is that he was involved with formulating "The Origins of the Value of a Statistical Life Concept" (November 25, 2014). Thomas Crombie Schelling thinks about the essence of phenomena. In scanning everyday behavior, he sees patterns and paradoxes that others overlook. When each driver slows down almost imperceptibly for a look at a minor roadside distraction, he observes, the result can be a massive traffic tie-up. The world can be divided into weak and powerful parties, but in some situations excessive power can be a handicap. Someone who is overweight may pledge fealty to a strict diet, then cheat at night. Schelling assesses the fat man's intramural struggle with the thin man trying to get out, noting that, with variations in the context, the Jekyll-and-Hyde parable may apply to us all. Schelling distills such essences and demonstrates their presence in many important social phenomena. "It's hard to define or categorize Tom's work," notes James Coleman, the sociologist. "If you ask, 'Does he do research?' I have to answer 'No, not exactly.' Then if you ask what he does for a living, I have to answer that he lives by his wits." The Bank of International Settlements carries out the Triennial Central Bank Survey of Foreign Exchange and Derivatives Market Activity, which in 2016 collected data from roughly 1,300 banks and other foreign exchange dealers across 52 countries. Michael Moore, Andreas Schrimpf, and Vladyslav Sushko describe some of the findings in "Downsized FX markets: causes and implications," which appears in the BIS Quarterly Review (December 2016, pp. 35-51). The headline finding is that the total turnover in foreign exchange markets dipped from $5.4 trillion per day in the 2013 survey to $5.1 trillion per day in 2016. As the figure shows, there had been a dramatic rise in the volume of foreign exchange trading since about 2000, so the dip is especially notable. Why the decline? The key point to understand is that most foreign exchange trading isn't related to exports and imports of goods and services According to the World Trade Organization, total global exports of merchandise and services approached $24 trillion for the entire year of 2014. Clearly, this isn't going to explain an FX market of $5.1 trillion per day. Moreover, foreign direct investment isn't the primary drivers of the FX market, either. Foreign direct investment is about $1.0-$1.5 trillion per year. 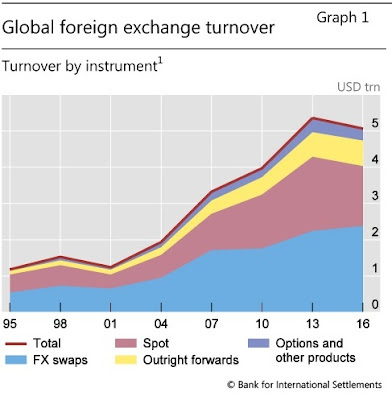 Part of the decline in global FX activity can be ascribed to less need for currency trading, as global trade and capital flows have not returned to their pre-Great Financial Crisis (GFC) growth rates. However, conventional macroeconomic drivers alone cannot explain the evolution of FX volumes or their composition across counterparties or instruments. This is because fundamental trading needs only account for a fraction of transactions. Instead, the bulk of turnover reflects inventory risk management by reporting dealers, their clients’ trading strategies and the technology used to execute trades and manage risks. ... The composition of participants changed in favour of more risk-averse players. The greater propensity to transact FX for hedging rather than risk-taking purposes by these investors has led to a decoupling of turnover in most FX derivatives from that in spot and options trading. Patterns of liquidity provision and risk-sharing in FX markets have also evolved. The number of dealer banks willing to warehouse risks has declined, while non-bank market-makers have gained a stronger footing as liquidity providers, even trading directly with end users. These shifts have been accompanied by complementary changes in trade execution methods. Market structure may be slowly shifting towards a more relationship-based form of trading, albeit in a variety of electronic forms. 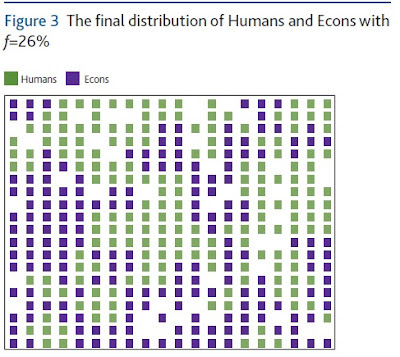 More detail on the results of the Triennial Survey is available at the BIS website. Here's one table that always catches my eye, dividing up the market according to the currency used in the foreign exchange deal. The statistics here include both buying and selling a currency, which of course both happen at the same time, but as a result of counting them separately, the total size of the market is 200%. Measured in this way, the finally column shows that US dollar accounted for 88% of the market volume (although I find it more useful to think of this as 44% out of a market size of 100%). The other nine most traded currencies are the euro (EUR), the Japanese yen (JPY), the British pound (GBP), the Australian dollar (AUD), the Canadian dollar (CAD), the Swiss franc (CHF), the Chinese yuan (CNY), the Swedish krona (SEK), and the New Zealand dollar (NZD). Clearly, the US dollar still rule the roost when it comes foreign exchange markets: indeed, it'd size of the market is the same now as back in 1998. Conversely, the share of the euro in foreign exchange markets started strong in 2001 and 2004, but has declined since then. The share of China's yuan in foriegn exchange market was essentially zero as recently as 2007, but it has now risen to 4% in the final column of the table--which I find more useful to think of as 2% of all FX transactions. The Board of Governors of the U.S. Postal Service is comparable to a board of directors of a publicly held corporation. The Board normally consists of up to nine governors appointed by the President of the United States with the advice and consent of the Senate. The nine governors select the Postmaster General, who becomes a member of the Board, and those 10 select the Deputy Postmaster General, who also serves on the Board. The Postmaster General serves at the pleasure of the governors for an indefinite term and the Deputy Postmaster General serves at the pleasure of the governors and the Postmaster General. Except that the Obama administration has not been appointing new members to the Board of Governors as the terms of previous members expired. When the term for James Bilbray expired last week and he was required to leave office, the contingent of nine appointees to the USPS Board of Governors is now down to zero members. As Bilbray said in November 2015, rather plaintively: " “I have the help of my Deputy Postmaster General and my Postmaster General, but I cannot effectively run the United States Post Office by myself. ... We are shocked that somebody out there doesn’t hear us, doesn’t hear how badly we are off. [We are down to] one governor: me.” As the USPS website puts it: "Each governor receives $300 per day for not more than 42 days of meetings each year and travel expenses, in addition to an annual salary of $30,000. Nine vacancies exist on the Board." As part of the executive branch, the Appointments Clause of the Constitution requires the Postal Service to be led by principal officers who are appointed by the president with the advice and consent of the Senate. The Governors fulfill that role, as was confirmed by the Ninth Circuit U.S. Court of Appeals. With no sitting governors, the Postal Service’s constitutional authority to take certain actions could be in question. This would be an unprecedented situation." The situation with the USPS Board of Governors raises some big questions, along with specific issues related to the postal service. The US President is now required to appoint people to about 3,800 positions, which can be broken down into four categories: "Presidential Appointments with Senate confirmation (PAS), Presidential Appointments without Senate confirmation (PSs), political appointees to the Senior Executive Service (SES), and Schedule C political appointees." Thus, while most of the attention for the incoming Trump administration is on high-profile appointments to cabinet-level posts, there are bigger issues. For example, who will get appointed to the thousands of less visible jobs? In addition, given that political appointees may move on to other jobs, and need to be replaced, the reality is that the the Office of the President needs to be on a continual hunt for people with the background and interest to fill thousands of positions--and given the turnover, probably needs to be appointing a few dozen people to a wide variety of slots almost every week. Filling these appointed slots has been an ongoing issue for the Obama administration. For example, a report in 2010 from the left-leaning Center for American Progress found: "The Obama administration had in place 64.4 percent of Senate-confirmed executive agency positions after one year, compared to 86.4 for the Reagan administration, 80.1 percent for the George H.W. Bush administration, 73.8 percent for the George W. Bush administration, and 69.8 percent for the Clinton administration. In percentage terms, after one year, the Obama administration ranked last or next to last (out of the five administrations examined) in filling important positions in 10 of 16 major federal agencies." Those problems with filling appointed slots continued: for example, here's a New York Times article on the problems of not filling appointed slots in 2013, and here's a Politico article on the same problems in 2016. Of course, a structural problem here is that potential presidential appointments are often blocked by grandstanding US Senators, often for reasons that don't have much to do with the actual person being appointed. But in many other cases, the situation is simply that no one is being put forward to fill appointed positions. The governors of the Postal Service must represent the public interest generally and not any particular group.Yet determining the public’s interest and how best to serve it can be difficult, even in the broadest sense. Some argue it lies in consistent and universally accessible consumer mail services; others in a vibrant commercial mail sector; still others in preserving the dissemination of cultural and civic discourse. When interests conflict, as in the controversies over service levels, network consolidation, and prices, balancing the public’s needs is the classic democratic conundrum. Each governor must decide for himself or herself what serving the public interest means. Thus, a member of the USPS Board of Governors gets relatively little pay (relative to the qualifications needed for doing the job), has very limited power to make significant changes, and are likely to be vehemently second-guessed if they support any decision that upsets anyone. So I'm not arguing that these slots are easy to fill. Still, when such a high proportion of appointed positions across government are going unfilled, and at least one board has completely run out of members, its hard to avoid the conclusions that the current system of presidential appointments is dysfunctional, and that the current White House has not done a particularly good job of navigating through the problems. 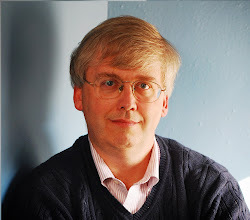 © 2011-17 Timothy Taylor. Picture Window theme. Powered by Blogger.